Another spring, another year of garden planning. Last year we rebuilt our vegetable garden from the ground up, complete with 10 raised beds, a 3 chamber composting area, and a fence high enough to keep out deer and deep enough to keep out burrowing bunnies. It was an exhausting project that I couldn't have accomplished without the help of a few good garden planning books. 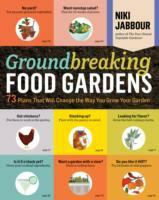 Local favourite Niki Jabbour's most recent book, Groundbreaking food gardens, really got me thinking about creating a space where that was attractive but also useful and flexible in its use of vertical space. Vegetable garden success! This year, I'm moving to a new project that I find a lot more intimidating even though it requires less infrastructure. The former owner of our house designed our front yard with water features, pathways, and loads of perennials designed to attract songbirds and other beneficial wildlife. I absolutely loved the garden when we first moved in, and was so happy to not have a boring patch of lawn to look at. Unfortunately I was unaware of the maintenance required by those beautiful perennials, and it's now a messy space where many of my favourite flowers have been crowded out by pervasive weeds. Fortunately, there are loads of books that will help me figure out how to transform this mess into a lower maintenance space that is still productive and beautiful. Many garden design books start with the assumption that readers will be replacing a blank expanse of lawn with flowers. In my case, I'm kind of doing the opposite. I want to move some of my perennials to other spots in my yard where they have the room to sprawl, and make a little space to set up a sitting area with a firepit. Lawn gone! 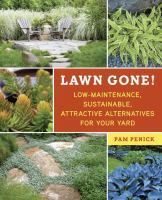 : low-maintenance, sustainable, attractive alternatives for your yard by Pam Penick has given me a few ideas on how to tame my yard. There's a chapter called "Places to Walk, Places to Sit" that have a lot of great ideas about how to create naturally surfaced spaces in the garden that are still surrounded by lush and sustainable beauty. 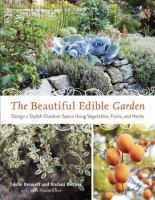 The beautiful edible garden : design a stylish outdoor space using vegetables, fruits, and herbs by Leslie Bennett and Stefani Bittner is full of amazing images of what I'd like to incorporate in my garden. I already utilize food plants in this part of the yard - last year when the big veggie garden was under construction I grew tomatoes, potatoes, lettuce, kale and lots of herbs in this space. It was productive and convenient, but definitely not very attractive! This book has given me a lot of ideas on how to interplant flowers and vegetables to make my space productive AND beautiful. And thanks to this book, I can now identify my particular garden as a cottage garden, which "can look messy if not given a balanced design". Yup! Sounds like my garden! Now that I've gotten some inspiration from these books and from gardening blogs, I need to make a concrete plan. 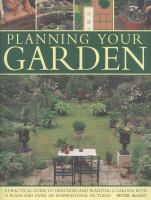 Planning Your Garden : A Practical Guide to Designing and Planting Your Garden by Peter McHoy is a slim book that lays out exactly what I need to do in a step by step manner. There are checklists, examples how to survey your existing space, tips on sketching out your plan on graph paper, and illustrations that demonstrate design concepts in an accessible way. I can easily get distracted by pretty pictures, so I appreciate that this book focuses on practical planning advice that will move me beyond the daydreaming stage into taking action! These four books are just a tiny sample of all the garden design books in our library system. Click here for a full list of titles.